What is Low Impact Development and why do we need it? In natural landscapes such as open space grasslands or forested areas, when rainfall occurs, some of it is intercepted by vegetation and evaporated off again and some of it soaks into the soil and replenishes soil moisture and groundwater reserves providing flows in creeks and rivers. In contrast, urban drainage systems have very low interception and groundwater recharge capacity and are designed to capture runoff from impervious surfaces and pipe it through a distributed network away from people, roads, and other urban infrastructure. Soil moisture is replenished by irrigation usually using potable water supply. Because urban pollutants are also found on impervious surfaces, pollutants are also inadvertently conveyed into collection systems and away from the urban system without treatment during rain storms (or due to irrigation overflows) leading to the pollution of urban creeks and rivers and nearby lakes, estuaries and coastal water bodies. Low impact development (LID) or Green Infrastructure (GI) are somewhat synonymous terms for greening or “botanizing” cityscapes through city planning efforts, infrastructure upgrades, and new/ redevelopment so that they mimic more natural landscapes. 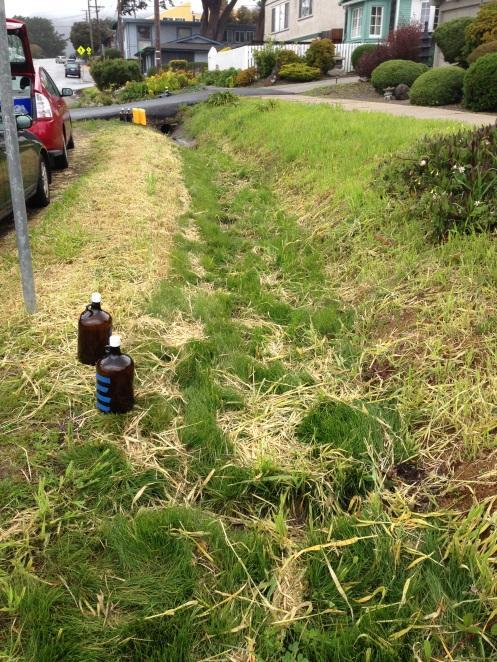 This is achieved through slowing, spreading, and infiltrating (sinking) urban stormwater run-off thus reducing stormwater peak flow and volume and potentially providing effective treatment of urban pollutants. There are different kinds of GI that incorporate mechanisms for slowing, spreading, and helping stormwater to soak into the ground. These mechanisms include slowing water velocities (adding roughness), detaining stormwater in vaults, ponds or depressed areas, retaining stormwater allowing sedimentation and reuse of captured volume (landscape irrigation or toilet flushing are examples), filtering stormwater through porous media (e.g. sand or other man-made filters and pervious pavement), infiltrating stormwater into the ground, and methods to treat stormwater such as the addition of activated carbon or the harvest of vegetation that is primarily nourished from nutrients in stormwater. 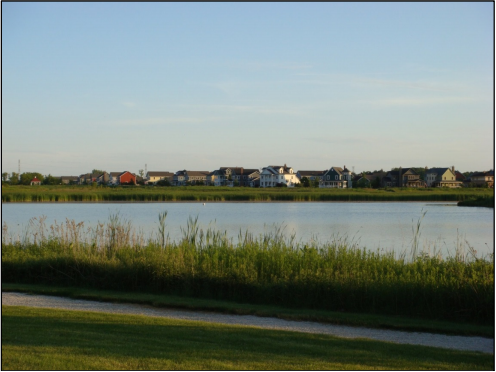 Since GI is now included in many stormwater permits for both flow and water quality control, it is important to place it in the urban landscape in the most beneficial locations with the least cost. Notwithstanding these immensely important water quality and quantity benefits, GI also provides a number of other benefits including helping to improve air quality and reduce greenhouse gases, heat island mitigation, traffic calming and helping to improve the bike/pedestrian environment, adding and connecting green spaces (and habitats for birds and wildlife) and helping to beautify neighborhoods and increase property values. These features help to connect the public with natural environmental processes leading to greater community involvement and caring for the cityscape. In many cases, it is these features, rather than water quantity and quality benefits, that primarily drive the community decision making process around inclusion of GI into redevelopment projects. Bioretention (with and without an underdrain as two different types) cells are small, vegetated, shallow depressions that serve to filter stormwater from impervious surfaces during rainfall events. Pollutants are removed from stormwater through adsorption, microbial activity, plant uptake, sedimentation, and filtration. Bioretention with out underdrains are more suitable to areas with higher soil filtration rates. Infiltration trenches are narrow trenches that have been back-filled with stone. Runoff is collected during storm events and stored in the void spaces of the gravel before being released back into the soil by infiltration. Figure 2. Infiltration Trench (Source: GI Definitions and Details, J. Walker). Permeable pavement, or pervious pavement, is a porous surface laid over uniformly graded stones. It reduces runoff volume, peak discharge rates, pollutant loading, and runoff temperature. Figure 3. 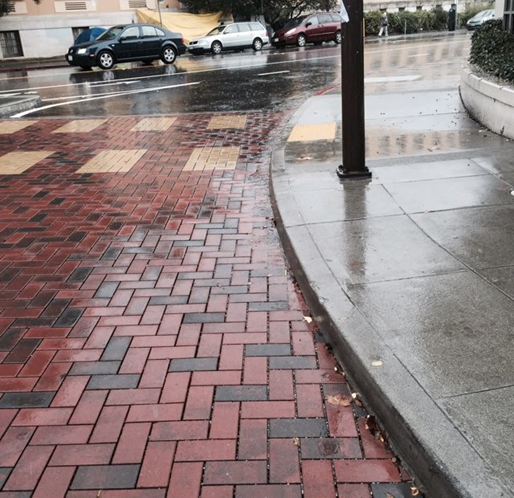 Permeable pavement on Allston St., Berkeley, CA (Source: courtesy of Berkeleyside). Storm water wetlands collect runoff and store it in a permanent pool. 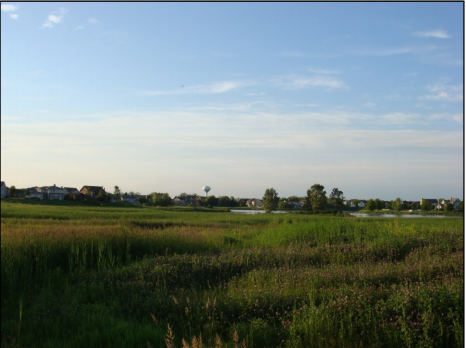 Stormwater runoff drains into these wetlands and the plants and soils act as a filter for the stormwater. Figure 4. Storm water wetlands (Source: GI Definitions and Details, J. Walker). Vegetated swales are broad, shallow channels with dense vegetation covering the sides of the slopes and bottom. They are designed to slow stormwater runoff and filter out particulate pollutants, and promote infiltration before reaching the stormwater drain. 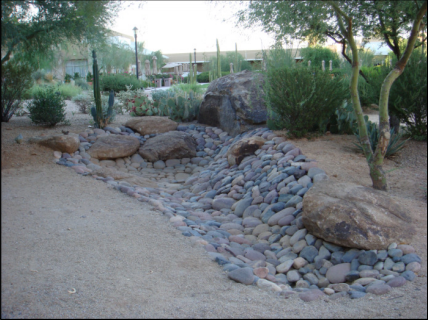 Wet ponds are used instead of a dry detention basin to provide flood control with enhanced amenities and aesthetics and improved pollutant removal. A wet pond provides similar benefits to stormwater wetlands, except they are typically deeper and may increase the temperature of runoff. Figure 6. Wet pond (Source: GI Definitions and Details, J. Walker). Flow Through Planter boxes are bioretention systems with an impermeable lining. 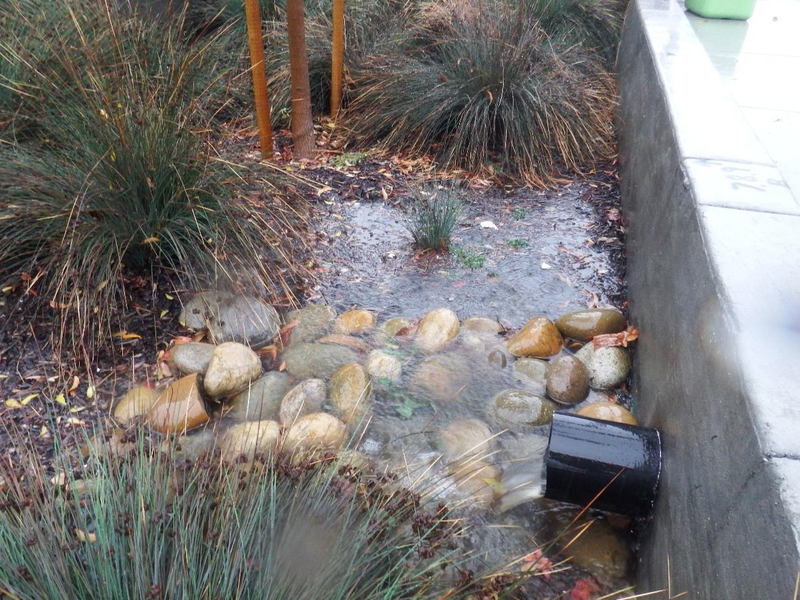 Water stored in the planter box is disharged through a pipe not through infiltration of native soils. Figure 7. Flow Through Planter. Tree Well boxes are small-scale bioinfiltration systems that are highly adaptable for small places. Tree wells are designed to collect runoff to allowing excess water to infiltrate into native soil or be collected by an underdrain. Figure 8. Tree well example by Filtera. The regional base analysis component of the tool was developed by SFEI in 2011 via a grant received through the Critical Coastal Areas (CCA) program, and provides a map of suitable GI areas as a starting point for further analyses. This analysis has been more recently run to create regional suitability layers for the additional GI types. 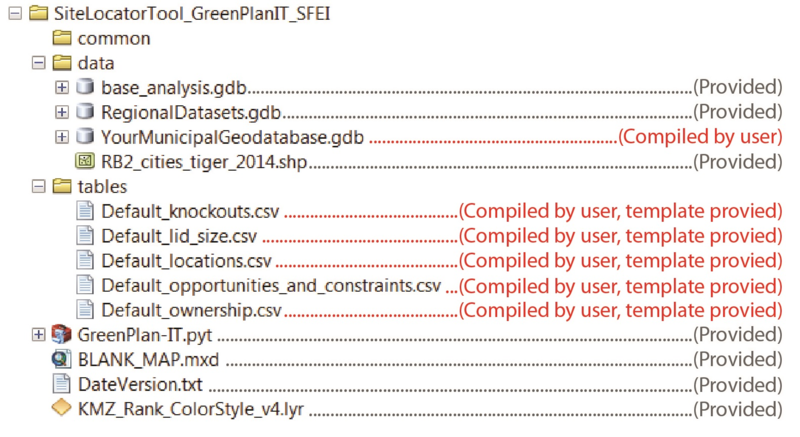 The regional base analysis output is provided in the GreenPlan-IT Site Locator Tool (in the file geodatabase base_analysis.gdb in the “data” folder). Each factor was binned into groups that represented more or less suitable conditions for each GI type. These rankings were then weighted and used in a Categorical Weighted Overlay to identify locations that were suitable for each GI type. Users may incorporate the base analysis provided either as an initial screening of suitable areas or during the ranking procedures (described below) but there are pros and cons. For example, incorporating the base analysis in the initial screening process provides a more refined (but exclusive) output since only locations that were deemed to be most suitable by the base analysis are included. Incorporating the base analysis in the ranking process provides a final output that is more inclusive of potential GI locations, and the results will not be limited to locations deemed suitable by the base analysis; rather, locations within the base analysis will receive a higher ranking than those not specified in the base analysis. This may be more desirable as many of the factors that were used to create the base analysis layer can be addressed by engineering and or design. That is, locations outside of the base analysis may still be possible locations for GI, however they may be more costly to install in those locations due to additional engineering and installation requirements (terracing due to slope, underdrain due to non-ideal soil type etc.). A city or county interested in saving costs by installing regionally applicable standard GI designs may need to take these issues into account when running the tool. These modules are described in the following table and address weaknesses that would ensue if just the regional base analysis were to be used for planning feasible LID locations. Regional datasets (in the file geodatabase RegionalDatasets.gdb in the “data” folder) are a collection of publicly available and SFEI-generated datasets that may be used in the Location, Ownership, Opportunities and Constraints, and/or Knockout Analysis modules. See here  for a description of the regional datasets provided. If municipality-specific data are available, users may choose to include these data in the Location, Ownership, Opportunities and Constraints, and/or Knockout Analysis modules. See Tool Preparation, I. Compiling Local Datasets. Download the SiteLocatorTool_GreenPlanIT_SFEI.zip here . Navigate to the SiteLocatorTool_GreenPlanIT_SFEI.zip; right-click on the zip file→Extract All…→Extract the contents to a folder. If you would like to store the tool elsewhere, move the extracted folder and its contents to your desired location. 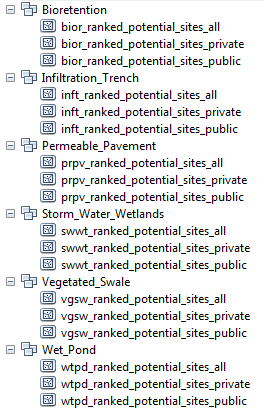 SFEI has provided the GreenPlan-IT Site Locator tool (with ancillary files), the regional base analysis, and the regional datasets in a preset folder schema, as shown below. If using local datasets, the user should reference the folder schema to determine the locations and formats of any compiled data. This will be described in detail in Tool Preparations. If you will not be using regional datasets (provided) or local datasets, skip to Run Tool: 1 – Site Locator Tool. If you will not be using local datasets, skip to Tool Preparations, Preparing Analysis Tables. If you will be using local datasets, continue with the next step which is compiling data sets. Create a new file geodatabase for your local datasets in the “data” folder. We recommend renaming your file geodatabase using the convention YourMunicipalityNameDatasets.gdb (i.e. ContraCostaDatasets.gdb). Save/export any relevant datasets to this new file geodatabase. The default spatial reference used by the GreenPlan-IT Site Locator Tool is NAD 1983 California Teale Albers (EPSG: 3310). As a best practice, we recommend projecting any local datasets to this spatial reference; however, this is not a requirement. When preparing to run the GreenPlan-IT Site Locator Tool, the user will be required to specify if any additional refined analyses (Location, Ownership, Opportunities and Constraints, and/or Knockout Analysis) will be used. The user may select any combination of refined analyses when running the GreenPlan-IT Site Locator Tool (i.e. any combination of 0 - 4 analyses). If using any of these additional refined analyses (Location, Ownership, Opportunities and Constraints, and/or Knockout Analysis), the user will be required to provide an accompanying table (templates provided by SFEI in the “tables” folder) for each analysis type desired. Each table provides details of the regional/local dataset(s) being used in the specified analysis. For each analysis type selected, the user will determine which regional/local datasets should be included. Open locations.csv in the “tables” folder. For each regional/local dataset to be included, use the locations.csv, Field Metadata  to determine entries in each table field. An example of a completed locations.csv table is here: Example locations.csv . Open ownership.csv in the “tables” folder. For each regional/local dataset to be included, use the ownership.csv, Field Metadata  to determine entries in each table field. An example of a completed locations.csv table is here: Example ownership.csv . Open opportunities_and_constraints.csv in the “tables” folder. For each regional/local dataset to be included, use the opportunities_and_constraints.csv, Field Metadata  to determine entries in each table field. An opportunities_and_constraints.csv table is here: Example opportunities_and_constraints.csv . To fill out the opportunities and constraints table, first you list all of the layers under layer name with it’s associated layer path, alias, query, and buffer size. Then you rank that layer as either a positive or negative factor for ranking a GI location. If it is negative, type “-1” under “rank” if positive then type “1”. (you can also make up your own factors and/or put all layers within one or two factors). Factor weight: Assign a weight to each factor such that the sum of all factor weights = 1 (for example, .25 for Local Development and .75 for installation feasibility if those were the only two factors you were using). A higher number indicates a higher weight for a particular factor. Provide this value to each layer row that the factor applies to. Layer weight: Within each factor, assign a weight to each layer so that the sum of the layer weights within each factor = 1. A higher number indicates a higher weight for a particular layer. If there is only one factor within that layer then the weight of that layer as 1. This table then runs nested weighted sums in order to produce a final ranking for each lid potential location. Note, you may choose to edit the opportunities and constraints table after viewing results. This is often an iterative process in order to create the most useful output for a user. Or you could purposely run it different ways for each neighborhood if there are specific local interests that are more or less important. Open knockouts.csv in the “tables” folder. For each regional/local dataset to be included, use the knockouts.csv, Field Metadata  table to determine entries in each table field. An example of a completed knockouts.csv table is here: Example knockouts.csv . SFEI has also provided lid_size.csv, which lists each GI type along with a suggested average area (square feet). When running the Site Locator Tool, the GI Size Table is used to remove GI locations that do not meet the minimum area specified. This table is also required if the user plans on running the Optimization Precursor Tool to generate inputs for the GreenPlan-IT Optimization Tool. Use of the gi_size.csv table is optional, but recommended. Open gi_size.csv in the “tables” folder. Adjust the values in the “ave_size_sqft” as desired/necessary. An example of a completed lid_size.csv table is here: Example gi_size.csv . See gi_size.csv, Field Metadata  for field descriptions. Open a new map document in ArcMap. If the ArcToolbox Window is not open, click the ArcToolbox button on the Standard Toolbar. 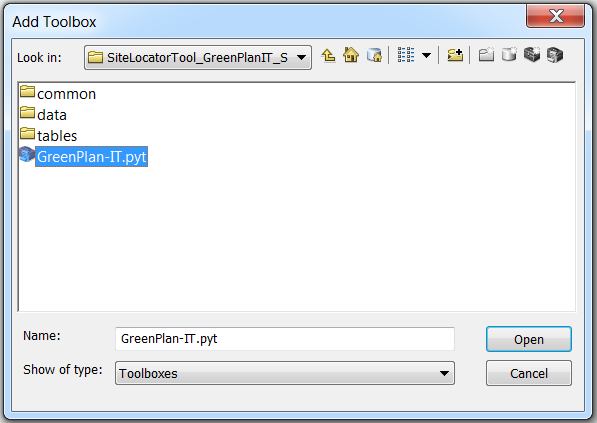 Browse to the location of the SiteLocatorTool_GreenPlanIT_SFEI folder, and select the GreenPlan-IT.pyt toolbox file. 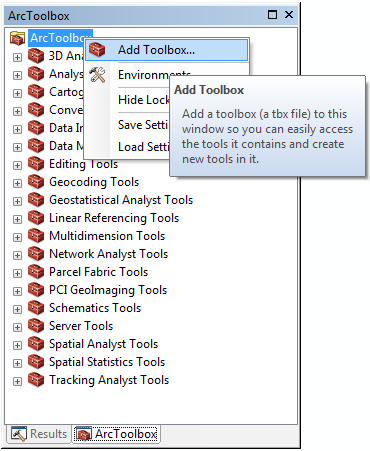 The GreenPlan-IT Toolbox has now been added to the ArcToolbox Window. The Site Locator Tool is the primary tool in GreenPlan-IT Toolbox. This tool identifies (and ranks, when Opportunities and Constraints Analysis is used) feasible locations for GI development. Double-click 1 – Site Locator Tool in the GreenPlan-IT Toolbox. Output Directory: Select the folder where you would like the site locator tool outputs to save. We recommend that the character length of the output directory be < 100 characters. Set the extent: You may set the extent by (a) selecting an Area of Interest or (b) setting a Custom Area of Interest using a polygon feature class with a single feature containing the desired boundary area. To select an Area of Interest: Use the Area of Interest dropdown menu and select the desired area. 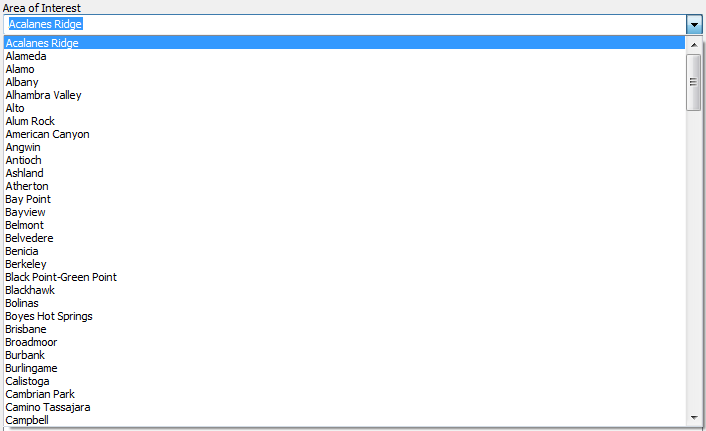 To select a Custom Area of Interest: Select "[Custom Area of Interest]" under the "Area of Interest" field. This activates the "Custom Area of Interest (optional)" field which you can then specify the polygon feature class containing your custom boundary. GI Types: Select at least one GI type to include in the Site Locator analysis. Modules (optional): Select the modules/additional analyses to be included when running the tool. Restrict Output to Base Analysis Extent: SFEI has provided a base analysis for each of the nine (9) GI types. Check to restrict the final outputs to only areas that overlap the regional suitability layer for each GI type. Note: The base analysis layers can be incorporated two ways: (1) Check “Restrict Output to Base Analysis Extent”to exclude all locations that are NOT identified as suitable area for each GI type in the base analysis. (2) Do not check “Restrict Output to Base Analysis Extent” to prevent results from being limited to locations identified as suitable for each GI type in the base analysis. You may still include the base analysis layer in the Opportunities and Constraints module and run the tool for that type of GI only, in order to rank locations that fall within the base analysis areas as higher. This second option may be the preferable method. See Preparing Analysis Tables. Module Tables (optional): Table paths should only be provided for selected modules/analyses. Locations Table: If you selected the Location Analysis module, navigate to and select your locations.csv table. Opportunities and Constraints Table (Default and GI specific): If you selected the Opportunities and Constraints Analysis module, navigate to and select your opportunities_and_constraints.csv table for each GI type. Note: you can specify a "Default" Opportunities and Constraints Table which will be used for any GI types that do not have a GI specific Opportunities and Constraints Table specified. Ownership Table: If you selected the Ownership Analysis module, navigate to and select your ownership.csv table. Knockout Table: If you selected the Knockout Analysis module, navigate to and select your knockouts.csv table. GI Size Table: If using average GI sizes in the Site Locator analysis, navigate to and select your gi_size.csv table. Export KMZ of Outputs: Check to generate KMZs of the GI locations; these may be viewed in Google Earth or Google Maps. Note: The KMZs generated by the GreenPlan-IT Site Locator Tool contain simplified feature polygons and should be used for general viewing purposes only. Any analysis should be performed using the feature classes in the file geodatabase. Save PNG of Outputs: Check to export a PNG map of the outputs. The legend provided with the tool will have to be added manually. Save PDF of Outputs: Check to export a PDF map of the outputs. The legend provided with the tool will have to be added manually. A ranking will only be applied when the Opportunities and Constraints Analysis has been applied. Feature classes ending in “_private” or “_public” separate GI locations into the private and public domains, respectively. These feature classes are only generated if a distinction between private/public areas has been made in the Location Table and/or Ownership Table. Each final GI location feature class will follow this field schema: Feature Class Metadata . For each GI type selected, the Site Locator Tool will generate a summary of GI areas (acres) by 0.1 rank intervals. These tables will have names according to the format, “GI_Area_by_Rank_GI Type_yyyy.mm.dd.csv”. Unranked areas will be assigned rank = 9999. If Export KMZ of Outputs was selected, a “KMZ_OUT_yyyy.mm.dd_hh.mm.ss” folder will be saved in the Output Directory. Each KMZ represents a geographic quadrant of the area of interest. A set of KMZ quadrants is made for each selected GI type (one set each for all locations, and private locations and public locations, where applicable). GI_Site_Suitability_AreaOfInterest_yyyy.mm.dd_hh.mm.ss_messages.txt – this is a text record of input tool parameters and execution messages/errors. GI_Site_Suitability_AreaOfInterest_yyyy.mm.dd_hh.mm.ss_summary.csv – this is a record of input tool parameters and completion times for any module analyses, as well as the total tool completion time. The Optimization Precursor Tool generates the required inputs for the GreenPlan-IT Optimization Tool. This tool calculates the total area of each GI type within each sub-basin (produced during hydrologic modeling of the area). Additionally, the Optimization Precursor Tool calculates the number of possible GI locations within each sub-basin based on the minimum GI areas defined in the GI Size Table. Note: Where multiple GI locations overlap, the overlap area is divided amongst the relevant GI types. In this way, total area is conserved. 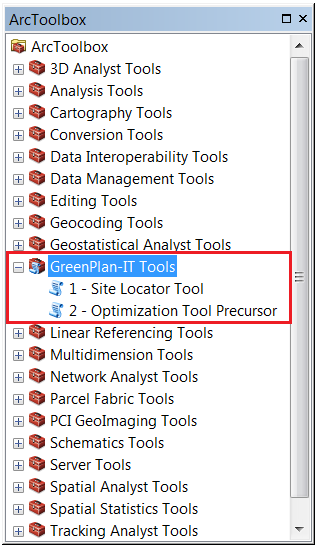 Double-click 2 – Optimization Precursor Tool in the GreenPlan-IT Tools toolbox. Input Geodatabase: Select the file geodatabase generated from the Site Locator Tool. The name of this geodatabase will have a name similar to LID_Site_Suitability_AreaOfInterest_yyyy.mm.dd_hh.mm.ss.gdb. Output Directory: Select the folder where you would like the Optimization Precursor Tool outputs to save. Sub-basin Feature Class: Select a polygon feature class containing the sub-basin boundaries for the area of interest. Sub-basin ID: Use the dropdown menu to select a unique ID field from the Sub-basin Feature Class. If a unique ID field does not exist, use the Object ID field. GI Types: Select the GI types to include in the Site Locator analy. GI Size Table: Navigate to and select your lid_size.csv table. GI Size Table Unit: Select the unit of measure in the GI size table: (SQUARE) FEET or (SQUARE) METERS. Ownership Domains: Use the dropdown menu to select the ownership domain. The primary output of the Optimization Precursor Tool is the table “Sub-basin_Model_Input_yyyy.mm.dd_hh.mm.ss.csv”. This table summarizes the total area by GI type in each sub-basin; it also estimates the number of potential GI installations (by type) in each sub-basin, based on the total area and average GI sizes as specified in the GI Size Table. The specific fields/field names included in this table will vary based on the user inputs.